Click Here to Get a Walker SoundFX Muffler While Supplies Last! Walker has been a familiar name in the automotive industry for over a century. They began specializing in exhaust system upgrades during the 1930s which would eventually lead to the expansion of their brand across the globe. Walker is a world-wide company with multiple facilities situated in different countries. These locations are home to emission control engineering and manufacturing divisions that are networked to share expertise. The result is a world class system that can support and deliver quality exhaust technology. This technology can be used to upgrade vehicles to perform better or make replacement parts more readily available. The exhaust systems on cars are subject to a multitude of road debris that can puncture and damage components, leading them to rust. The process is even worse if you live in an area with heavy snowfall and road salt. The muffler is the component that collects the most condensation and is usually the first to rust out. When your exhaust system leaks, there is a noticeable change in your exhaust sound which can be described as a puffing or puttering noise that may be heard inside the passenger compartment. When the noise level gets unusually loud, chances are there is a large leak (from a broken connection) or the muffler has failed. The Walker exhaust company develops O.E equivalent replacement mufflers should you ever need one. 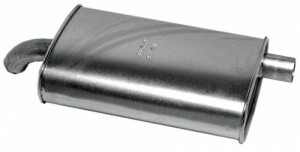 An example of one of these mufflers is the SoundFX series available for several different makes and models. For those who drive a 1998-2002 Honda Accord (2.3 liter engine), the 18904 model is a direct fit. The inner workings of a muffler are deceptively simple. There are tubes with holes in them housed inside a chamber. The muffler channels the exhaust through a series of perforated tubes to slow it down and also reflect the sounds waves to partially cancel out noise. Walker’s SoundFX Mufflers are constructed from 100% aluminized steel. This material is not only lightweight, but durable and more resilient to rust. These mufflers also feature spun-locked heads to prevent any unwanted rupture or backfires. The 18904 is a muffler and tailpipe assembly with a flanged inlet and welded bracket that fits perfectly into its specified application. The Sound FX muffler is definitely not a flashy product; it provides functionality at a value that most original equipment manufacturers cannot meet. Not every customer shopping around for exhaust is looking for a full 3” polished system that grants huge power gains. Many vehicles are in simple need of a repair that gets the job done. Where the industry lacks in replacement parts, the Walker exhaust company is the answer.